Seven Fareham Nomads swimmers flew the flag for Great Britain in the World Masters Swimming Championships. The Nomad charges claimed 12 top-10 finishes – including two gold medals and two Championship records – at the event in Budapest, Hungary. Claire Tagg, John Molyneaux, Laura Molyneaux, Tony Corben, Jo Corben, Andy Green and Noémie Plumridge all registered fine performances. Corben was the Nomads’ stand-out swimmer. Competing in the 45–49 age group, she emphatically claimed two gold medals in the 100m and 200m backstroke events – recording Championship records in the process. In the latter event, Corben beat Atlanta 1996 Olympic gold medallist Claudia Poll, from Costa Rica. 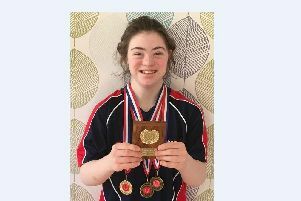 She also won bronze in the 100m backstroke. John Molyneaux started the meet off with a bang to claim fifth place in the aged 24–29 200m backstroke event, while Laura raced admirably to finish sixth in the 400m individual medley in the aged 30–34 age category. Plumridge swam lifetime bests in the 50m and 100m butterfly, finishing ninth and tenth respectively. Green also recorded a personal-best time in the 200m freestyle in 2min 24.59sec. Tagg successfully completed a hat-trick of best times in the 50m butterfly, 100m breaststroke and 200m individual medley. She displayed her versatility across a range of disciplines. Tony Corben, who is back in the water after recovering from major neck surgery, placed 48th in the 50m butterfly with a season’s best time of 34.47, as well as finishing 34th in the 100m butterfly. The Fareham Nomads ladies’ team also swam a lifetime best in the 4x50m individual medley relay to place eighth in the 120–159 years age category. The mixed team of John Molyneaux, Laura Molyeaux Green, Plumridge and competed for the first time together in the mixed 4x50m individual medley relay and placed 11th in the 120–159 age group. John Molyneaux said: ‘The competition was a fantastic experience to be part of and we are proud to have represented Fareham Nomads and Great Britain.